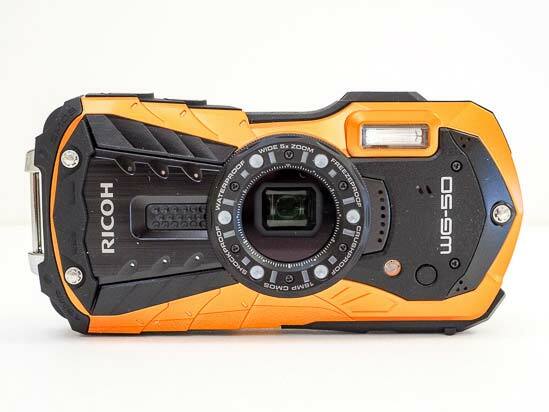 The Ricoh WG-50 is a new waterproof, shockproof, freeze proof and crushproof tough compact camera. The WG-50 is waterproof to a depth of 14 metres, shockproof against falls from a height of 1.6 metres, and freeze-proof to temperatures as low as -10°C. It also features a 16 megapixel back-illuminated 1/2.3 inch CMOS sensor, 5x optical zoom lens, Full HD movie recording, and six LED Macro Lights positioned around the lens barrel for macro shooting. 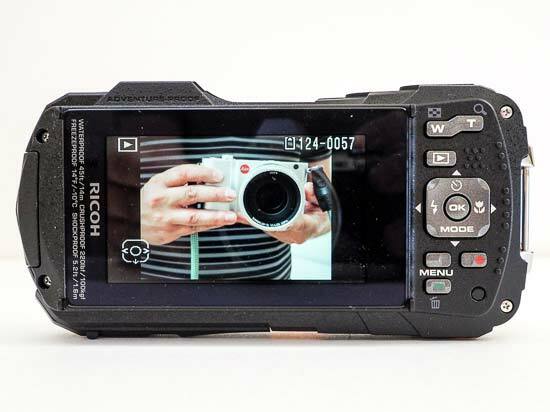 Available in black and orange, the Ricoh WG-50 retails for £249.99 / $379.95. 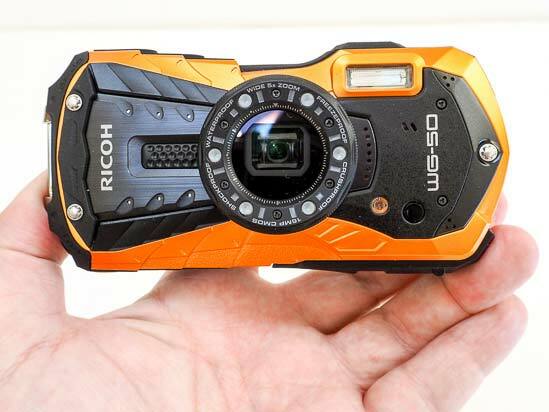 The Ricoh brand has a new action camera for your delectation – the water, dust and shock resisting WG-50. It arrives styled in much the same futuristic, rugged-camera-meets-Blade Runner manner as its predecessors and brightly coloured enough that you won’t lose it in the snow or the bottom of the pool, going by the satsuma orange version we had arrive on the Photography Blog test slab. The alternative choice of camera body is a sober black. Official dimensions for the unit are 61.5x122.5x29.6mm, whilst the WG-50 weighs 193g loaded and ready. IN other words it will fit as readily in a pair of shorts this summer or jacket this winter as your actual camera bag. Like its rival in the Nikon Coolpix W300 – equally ‘point and shoot’ as regards operation – headline effective resolution is 16 effective megapixels from a 1/2.3-inch CMOS sensor, and it’s freeze-proof to temperatures as low as -10°C, which is pretty standard for this class of camera. Also reading like an exercise in box ticking is further specification including its internally stacked 5x optical zoom, here offering the wide-angle equivalent of 28-140mm in 35mm film terms. Falling slightly short of the newest Nikon’s spec, however, is the fact that the Ricoh WG-50 is waterproofed to depths of 14 metres (as opposed to its competitor’s 30 metres) and shock proofed against drops of 1.6 metres in height (rather than the Nikon’s 2.4 metres) – and we get Full HD video shooting at 30fps rather than 4K video. That said, the WG-50 is more than £100 cheaper than the W300 on release, which shouldn’t be sniffed at. Another neat feature, carried over from previous generations of the Ricoh, is six macro LED lights arranged around the lens in a circular ring-flash like array, aiming to provide extra and even illumination for macro shots, if needed. In the wholly expected absence of any eye level electronic or optical viewfinder, images are composed via an elongated 2.7-inch LCD at the rear, on which brightness can be adjusted. When compared with the screens we’re now used to deploying daily on our smartphones – along with the 3-inch+ screens found on most compacts and CSCs – this feels a little small by current standards. Though perfectly workable from a compositional perspective, inevitably it’s hard to determine something is pin sharp or correctly exposed just by looking at the screen alone. We found images often appeared brighter on the camera’s LCD than they did when we got back home and downloaded them to our desktop. 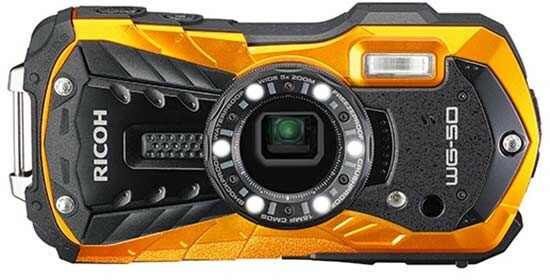 As we’d expected from a device that can be unceremoniously dunked in the bath, sea, pool or snow, there are also locking mechanisms and reinforced covers protecting both the USB/ HDMI ports – located on one flank of the Ricoh WG-50 – and card and battery slots, found at the camera’s base. Unusually, the screw thread for attaching it to a tripod is located over at a far edge, rather than slap bang in the middle. The result is that if you were using the camera with a mini tripod, there would be sufficient room to remove card and battery without having to unscrew the camera itself. From the front, then, the Ricoh WG-50 continues the futuristic plaything-like design of its predecessors in the WG-3, WG-10 etc. 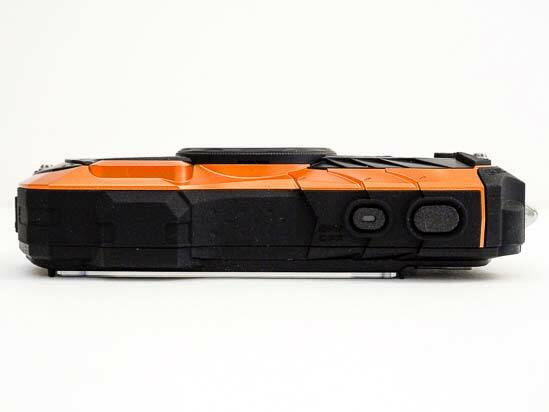 It’s certainly a unit that looks set to stand out in the crowded action camera marketplace. The slanted faceplate design both resembles a ‘go faster’ pair of teenage boy’s trainers/sneakers and provides a slightly roughened surface to grip, to boot. As a result it doesn’t really matter that there isn’t any dedicated handgrip to speak of. The whole of the camera, save for the flat, shiny LCD at the rear, is eminently grip-able. Because it incorporates the LEDs, as touched on earlier, the lens surround on the Ricoh WG-50 isn’t removable in order to add filters or conversion lenses, like, say on the competing Olympus TG-5. But a plastic adapter is included out of the box. Otherwise we get self-timer and AF assist lamps bottom right of the lens, if viewing the camera faceplate-on, with a built-in bulb for the flash sitting top right, and pin pricks housing built in stereo microphones sitting nearby. Indicating its toughened status, the faceplate follows the tradition of such cameras by featuring visible screws, positioned both left and right of the lens – for which the only purpose appears to be decorative. The only issue with the positioning of both the lens and the flash here is that it is easy to partially obscure them with the ends of fingers when operating the camera – but in truth that is an issue with most compacts that try and squeeze in as many features as possible, and particularly an internally stacked zoom lens, as the Ricoh WG-50 does here. The top plate of the Ricoh WG-50 is almost as ridged and as roughened as the faceplate, although instead of metal we get more obvious plastic moulding here. Still, its implementation prevents fingers slipping, so there are practical as well as aesthetic reasons for including it. Slightly raised, yet protected by an equally raised surround, is the lozenge shaped on/off button that glows with a green light when the camera is active, to the right of which is a similarly shaped but slightly larger shutter release button. Both these controls automatically fall under your forefinger as the Ricoh WG-50 is gripped in the right hand. A press of the power button and the camera readies itself for the first shot in just over a second – so if you foresee a shot in your mind’s eye, there is the potential ability to be able to move quickly enough to catch it. A half squeeze of the shutter release button and the camera’s AF point illuminates in green to signify focus and subject has been determined. Press down fully to take the photograph and the screen freezes for just under two seconds whilst data is being written to inserted SD card, giving us a perfectly acceptable performance for this class of camera. Whilst the right hand flank of the Ricoh WG-50 features a large lug for attaching a provided hand or wrist strap, and nothing more, the opposite side of this device features the protected mini and micro HDMI and USB ports. The cover hiding these has a catch that needs to be opened before the thing slides off (held on via a further catch) to reveal the ports beneath. It won’t be a surprise to learn that the battery can be (and indeed is) charged in camera. This compartment is located separately at the base of the camera, as already discussed. Again, it would be hard to accidentally open either of these compartments if using the camera underwater, as doing so requires a push down and side open activation. The backplate control layout of the Ricoh WG-50 is pretty familiar to anyone who has ever handled a dedicated digital compact. The wide/ elongated LCD screen takes up most of the space here and quickly becomes smeared with thumb prints in operation – not that you’re going to be unduly worried about keeping a toughened camera looking pristine. Shoehorned in to the right of this is a narrow band of physical controls, starting out with a zoom lever top right printed with wide and telephoto settings, beneath which is obviously the playback button. The zoom is fast and responsive; starting out at maximum wide-angle setting when the camera is activated and zooming to maximum telephoto setting, with your thumb kept pressed down, in all of two seconds. Set in the midst of the backplate buttons is the four-way controller that, at various points north, east, south and west, features user-selectable settings for self timer, macro mode, and general shooting modes – a selection of which summons up crude but function-discernable cartoon-like graphics on screen that now begin to resemble an 1980s video game – plus, at the ‘west’ setting, selectable flash modes. The options here are automatic flash, flash off, forced flash, auto red eye reduction, forced flash with red eye reduction. The shooting mode options here are many and plentiful, ranging from auto, through program, HDR, handheld night snap, movie, high speed movie, close ups, landscapes, flowers, portraits, dedicated underwater stills and movie settings, interval shooting… dedicated modes for surf, snow, pet and child portraits… pre-optimised settings for night time shooting…the list goes on. The remaining buttons on the Ricoh WG-50’s rear panel are the self-explanatory menu, record and function/delete buttons. Battery life is fair for a camera of this ilk, at 300 shots per charge, or up to 90 minutes of video. Not revolutionary by any means, but no slouch either for this class of device. So how do the images match up to the specification and performance? Are what we’re getting here images that transcend the Ricoh WG-50’s point and shooter status, or do they very much indicate a camera that is about resilience and being able to take images in conditions in which you’d otherwise not dare to, first and foremost?